Local artist Nicolina Johnson, better known as just Nicolina, revealed the latest in her series of epic “portals” today, and moved quickly to fix one that had been vandalized. 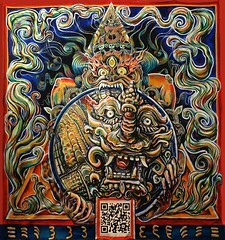 Portal 3, titled “Movement,” was unveiled on the artist’s Facebook page along with a brief description: “The Lord of Death from the Tibetan Wheel of Life pictured at the top of the triangle, represents the Impermanence; change. The Baby Dragon inside the circle represents the movement of time and the three dimensions.” The painting, which is about the size of a doorway, should go up “somewhere around Second Street” in May, said Nicolina, who lives on East Second Street, near Avenue A. 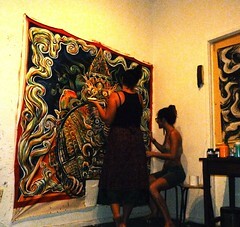 The artist and her partner on the project, Pérola M. Bonfanti, are currently in Rio de Janeiro, Brazil, where today they planned to start work on Portal 4, titled “The Material World, Nature and Sexuality.” While away they’re organizing a Kickstarter campaign to raise money for Envirotex, a varnish that will prevent vandalization of their art. The campaign’s grand prize? A personalized portal in your home. The artist told The Local that an East Village friend, Eva Wright, had agreed to replace the QR code that points readers to the interactive project’s Website. As of 4:30 p.m. today, the code was still missing. Nicolina plans to return to New York sometime this April and hopes that each of her 13 pieces will be on display before the end of July. Next post Street Scenes | More Centre-Fuge!